Collection of Dr. Seymour Rosenfeld, Washington, D.C.
Quay Gallery, San Francisco, Peter Voulkos: Ceramics, 16 April-4 May 1974. Fendrick Gallery, Washington, D.C., Clay USA, 20 January-20 February 1975, Catalogue, ill.
Braunstein/Quay Gallery, San Francisco, Peter Voulkos: The Montana, Otis & Berkeley Years,. 22 January–21 February 2009. Frank Lloyd Gallery, Santa Monica, California, Peter Voulkos: A Survey. 30 April-28 May 2011. Slivka, Rose. 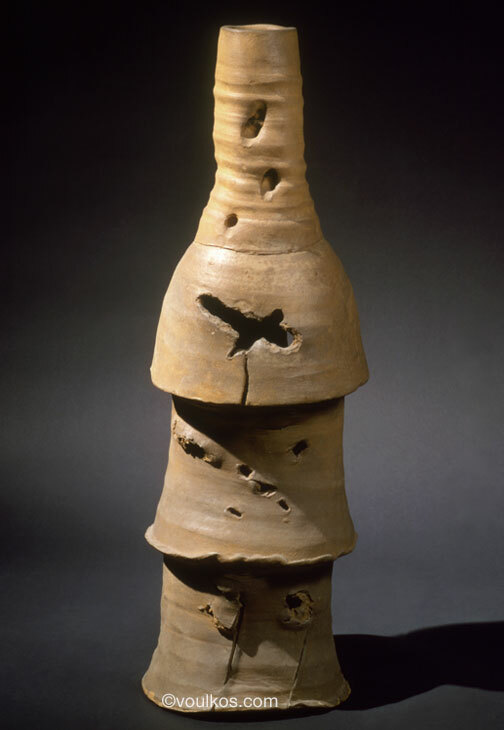 Peter Voulkos: A Dialogue with Clay, New York. New York Graphic Society in association with the American Crafts Council, 1978, ill. fig. 49, p. 75. Andréani, Carole, Peter Voulkos: Naissance de la Céramique Américaine, La Revue de la Céramique et du Verre, (France), March-April 2007, ill. p. 30. Lauria, Jo. Peter Voulkos Survey: A Review, Ceramics: Art & Perception, March-May 2012, ill. p. 58. Silbert, Susie, J. High Function: The Vessel in Ceramic Art, American Art Collector, December 2014, ill. p. 203.